Brendan Haywood Says NBA Players Are "Fake Tough Guys"
Every morning, the fine folks at Sports Radio Interviews sift through the a.m. drive-time chatter to bring you the best interviews with coaches, players, and personalities across the sports landscape. Today: Haywood says he never punched Dwight Howard. Brendan Haywood joined ESPN Dallas with Ben & Skin to discuss being the boxer who invented the "double punch" against Dwight Howard, Stan Van Gundy claiming he "double punched" Howard, the most physical player in the NBA, his reaction to Van Gundy claiming he "double punched" Howard, and the Orlando Magic coaching staff not finding any footage of him punching Howard in the back. Let's now go to the favorite boxer of the show. The man who invented the "double punch." It is Brendan Haywood. How are you doing? Explain what happened where Stan Van Gundy claims he has film of you "double punching" Dwight Howard in the back? "Well I guess he's got something no one else has. Like I said it is a physical game and sometimes guys get testy with elbows, throwing forearms. No one throws any punches out there. NBA guys? We are not about that. It's all WWE to us. We're fake tough guys. No one throws any real punches. It's unfortunate Stan feels that way. I know he has to protect his guy, but it's just not the case. No one has any footage of it I guess except him, so unless he has Patrick Ewing on the bench taping with his iPhone I don't think that really happened." Who's the most physical player in the NBA? 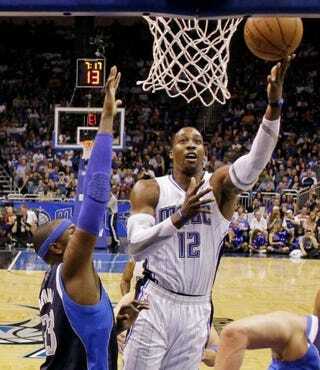 "Oh Dwight [Howard] hands down. I mean first play of the game he popped me real good in my chest. He hit me so hard in my chest I felt it in my knee. You know you are not supposed to get hit hard enough in your chest when you feel it in your knee. I didn't know what that was about, but that was tough coming back in my first game against Dwight Howard and it doesn't get any easier tonight. I am going to be guarding Blake Griffin and I am not 100% yet, but I am working to get there." What was your reaction when you heard Stan Van Gundy's accusations and where were you? "I was at home and I thought Stan Van Gundy was sitting there by the calendar because it was April 1st. I thought it was a big April Fools' joke. I thought we were all going to laugh about it and all of a sudden I realized that he was serious. I was like okay well it is what it is. There's nothing to it." Have you talked with the Magic coaching staff about it? "It was a non-issue because they went back and looked at it. They didn't find it. Our video equipment guy was told to go look for anything that looked like a punch through my minutes and he's like there is no punch. I was watching NBA TV and they were talking about it and they were like Stan said it happened, but we looked for the footage and we couldn't find it. Like I told you no one has this footage except for Stan. Stan has it and is going into his video archives." • Bruce Weber says Illinois will really miss him. • Matt Cain is the richest righty in baseball history. • Anthony Davis wasn't going to leave Kentucky without a ring.